Jonathan Davies was regarded as one of the most gifted players of his generation and his talent was rewarded with international recognition in both codes of the game during a 15-year playing career. After being rejected by Llanelli, Davies signed for Neath in 1982 where he caught the eye of the national selectors. He made his Wales debut in the 24-15 victory over England in the 1985 Five Nations Championship - scoring a try and slotting a drop goal on his way to the Man of the Match honour. Following a switch to Llanelli in 1988, he went on to play a key role in Wales Triple Crown success the same year before captaining his country on the ill-fated tour of New Zealand that summer. A defeat at home to Romania led to him switching codes and joining league side Widnes for a record £230,000 in December 1988. He later admitted fear of being dropped and financial uncertainty were the catalysts for the decision. His spell in the professional 13-man code also saw him play for Warrington and southern hemisphere sides Canterbury and North Queensland. Davies also become a dual-code international with appearances for both Great Britain and Wales. The scrapping of amateur status in 1995 allowed Davies to returned to the newly professional rugby union in 1995 with Cardiff and he went on win another five caps, the last against England in the 1997 Five Nations. 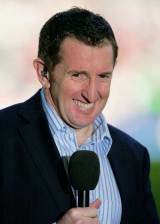 After his playing career was over Davies went on to forge a career as a respected television pundit for the BBC covering both rugby codes, in both English and his native Welsh language.